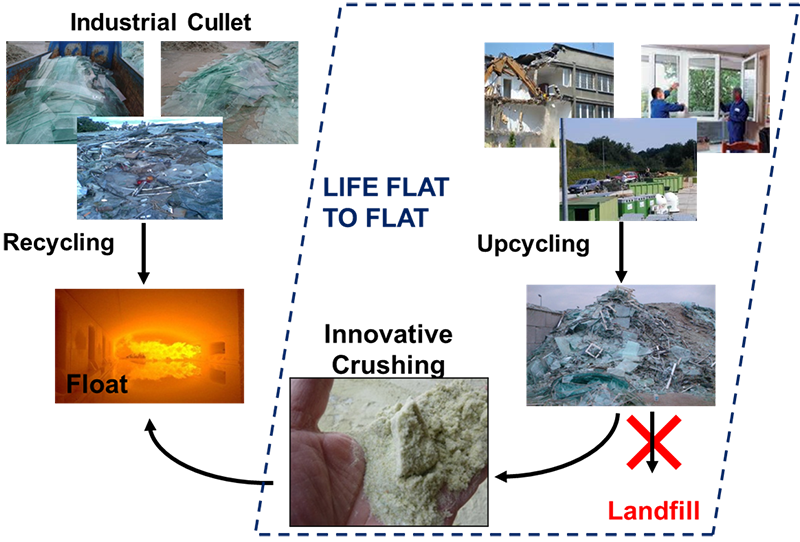 This project aims to develop and validate an innovative method for recycling and up-cycling glass and other waste materials in the production of flat glass. This aim will be achieved through an innovative grinding technology that allows the content of recycled materials of the final flat glass to be raised to 25%, and the use of up to 55% of glass cullet. The recycled materials introduced in this project will come from sources that could not previously be used by the glass industry (e.g. glass fibre) because of their negative impact on glass quality and the production process. The innovative processing technique will also make it possible to use cullet that contains 1000 times more ceramics, stone, and porce-lain (CSP). The project will cover the entire glass lifecycle, thereby not only demonstrating the technique, but also defining its infrastructure. Besides a significant reduction of the use of raw materials, it will also lower energy consumption by 5% and CO2 emissions by 12%. © 2017 AGC All rights reserved.